Martin Luther King, civil rights activist. Nobel Prize winner1964. Martin Luther King was one of the most prominent civil rights leaders who came to symbolise the non-violent struggle for social change. 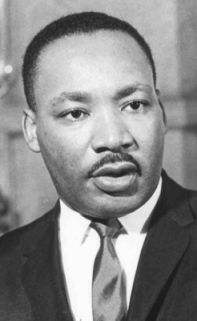 The speeches of Martin Luther Kingare amongst the most memorable speeches by public figure. Martin Luther King was able to inspire the black population to assert their civil rights. From a political perspective the civil rights movement was largely succesful with significant legislation passed in the 1960s.